The campaign to impeach Brazilian President Dilma Rousseff is a "congressional coup" by the the country's conservative political groups affected by her policies, a Bolivian lawmaker told Sputnik. LA PAZ (Sputnik) — On Monday, a committee of Brazil's lower house approved a report recommending the impeachment of Rousseff. "This is a congressional coup which is driven by the sectors of the international right which had their interests hit and who are looking to overthrow the popular governments of the region, we are not surprised by this, but we as Bolivians will act in support president Dilma Rousseff," Edmundo Polo, the president of the Committee on International Policy and Protection of Migrants of Bolivia’s lower house, said. According to Polo, Rousseff is facing an offensive from the conservative sectors tied to "powerful transnational corporations." Rousseff has been facing a wave of public discontent for over a year amid Brazil’s struggling economy and a major corruption scandal in the state-owned Petrobras petroleum company. 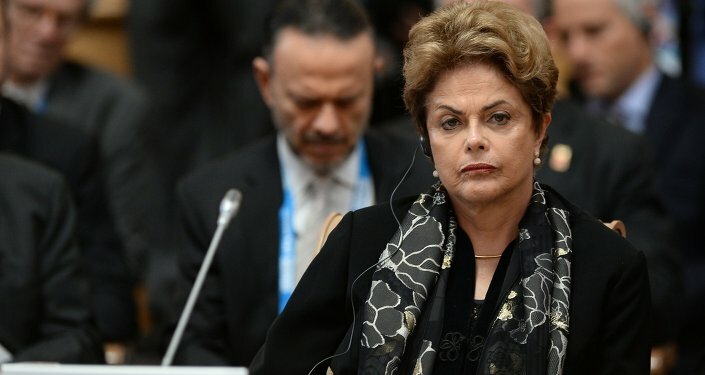 Lower house lawmakers supported impeachment procedures against Rousseff early last December. In late March, the Brazilian Democratic Movement Party left the governing coalition, leaving the president with even fewer allies.